Living at the (English) edge of the world » Kingdom Come: Deliverance – how does the in-game map compare to real world? Kingdom Come: Deliverance – how does the in-game map compare to real world? If you ever wondered how exactly does the medieval world of Kingdom Come: Deliverance align with the real world map of the Sasau region, here’s your chance to find out. Yes, all of the game locations are real and you can visit them (or what’s left of them today). And while the game takes certain liberties with the locations and the map and shuffles things around a bit, overall, it’s actually pretty accurate. The region in question is located around the town of Sázava (Sasau) with the eponymous river winding its way through the region. Here is the area on Google Maps. As you can see, the in-game map is basicaly a cut up version of three different areas around the town of Sázava. First is the area around Stříbrná Skalice (Skalitz), which is also the area where the game begins it’s surprisingly long tutorial/introductory part. It also includes the hamlet Rovná and the hamlet of Přibyslavice (Pribyslavitz). The main points for the alignment of this area was the actual Skalitz castle location (no longer standing – the stone from the castle was used to build a new church in the general area of the castle) and the location of the church in Rovná. Rovná is now part of Skalitz. As for Pribyslavitz, it looks like the in-game location might have been moved a bit – the hamlet doesn’t really exist anymore and I’m not sure of its exact location. As you can see, it is however quite further away from Talmberk than it would seem in the game (the same obviously goes for both Rovná and Skalitz). The second and the largest area is the Rataje nad Sázavou (Rattay upon Sasau) area. There are several villages and/or hamlets in the area, most of which still exist to this day. 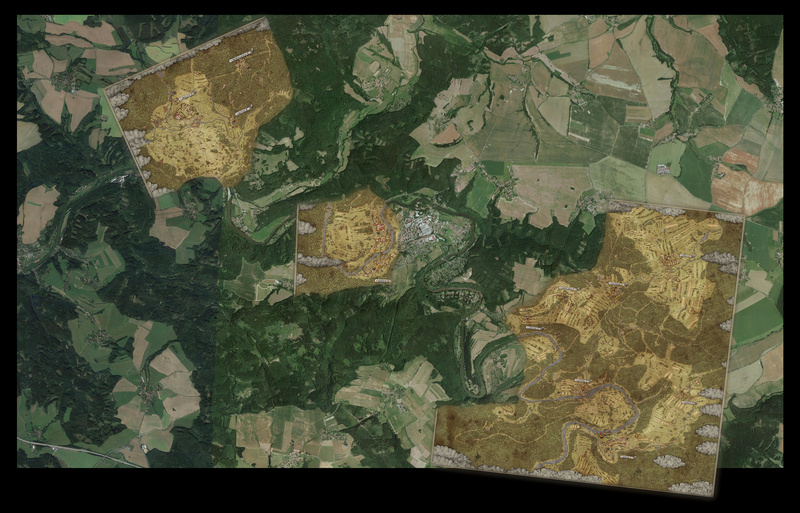 For the alignment of this part of the map, I was using as much of the geography as possible – my main point of interest was the Rattay mill, and then I followed the river, as well as the locations of Ledečko (Ledetchko), Talmberk and Úžice (Uzhitz). The whole are is almost a perfect match for the game – there are some changes and inaccuracies, but it’s hard to say what’s due to game design liberties and what has more to do with the fact we’re trying to match areas across the time gap of over 600 years. The only notable change to the map is the length of the straight part of the river Sasau downstream of Ledetchko – it was obviously shortened a bit to allow for the inclusion of the third and final area of the game. This third area is pretty much just the area of the town of Sázava (Sasau). 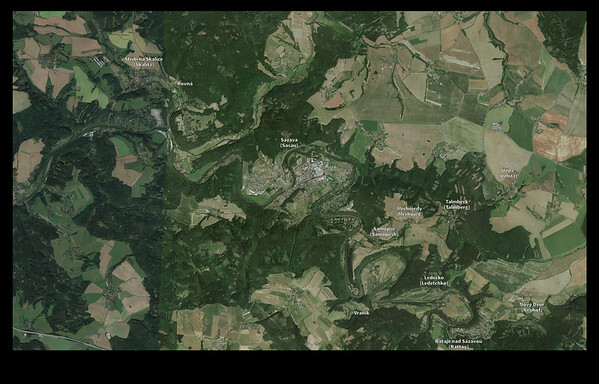 As you can see, in reality, Sasau lies more or less halfway between Skalitz and Rattay, some 6 kilometers (as the crow flies) from Rattay and 5 kilometers from Skalitz. With the game map being square, the town of Sasau was reduced in size and moved some 2,5 kilometers to the south and about a kilometer to the east, with the river Sasau losing a few of its meanders in the process. The southern edge of the town is now pretty much next to the hillfort Vraník and the town itself is now also much closer to the village of Samopše (Samopesh). When aligning this part of the map, I was mostly following the river, as well as the Sasau monastery location and the general town area. The in-game river follows the real one pretty closely right about to the point of the ford northwest of Sasau. And that’s basically it. It’s interesting to see how accurate the in-game map is for the most part, and I have to admit I was quite surprised to see how much of the in-game world actually translates to real life accurately. It’s certainly an impressive achievement. BTW, for those interested, here’s my “photo” gallery of Kingdom Come: Deliverance. At the time of the writing of this post, it only contains the two images linked above, but I have some “photos” from the KC:D world ready to upload soon, so stay tuned.